Cygnus is a northern constellation lying on the plane of the Milky Way, deriving its name from the Latinized Greek word for swan. Cygnus is one of the most recognizable constellations of the northern summer and autumn, and it features a prominent asterism known as the Northern Cross (in contrast to the Southern Cross). Cygnus was among the 48 constellations listed by the 2nd century astronomer Ptolemy, and it remains one of the 88 modern constellations. Cygnus contains Deneb (ذنب, translit. ḏanab, tail) -which is one of the brightest stars in the night sky and is the most distant first-magnitude star- as its "tail star" and one corner of the Summer Triangle. It also has some notable X-ray sources and the giant stellar association of Cygnus OB2. Cygnus is also known as the Northern Cross. One of the stars of this association, NML Cygni, is one of the largest stars currently known. The constellation is also home to Cygnus X-1, a distant X-ray binary containing a supergiant and unseen massive companion that was the first object widely held to be a black hole. Many star systems in Cygnus have known planets as a result of the Kepler Mission observing one patch of the sky, an area around Cygnus. In addition, most of the eastern part of Cygnus is dominated by the Hercules–Corona Borealis Great Wall, a giant galaxy filament that is the largest known structure in the observable universe, covering most of the northern sky. Cygnus as depicted in Urania's Mirror, a set of constellation cards published in London c.1825. Surrounding it are Lacerta, Vulpecula and Lyra. In Greek mythology, Cygnus has been identified with several different legendary swans. Zeus disguised himself as a swan to seduce Leda, Spartan king Tyndareus's wife, who gave birth to the Gemini, Helen of Troy, and Clytemnestra; Orpheus was transformed into a swan after his murder, and was said to have been placed in the sky next to his lyre (Lyra); and the King Cygnus was transformed into a swan. The Greeks also associated this constellation with the tragic story of Phaethon, the son of Helios the sun god, who demanded to ride his father's sun chariot for a day. Phaethon, however, was unable to control the reins, forcing Zeus to destroy the chariot (and Phaethon) with a thunderbolt, causing it to plummet to the earth into the river Eridanus. According to the myth, Phaethon's brother, Cygnus, grieved bitterly and spent many days diving into the river to collect Phaethon's bones to give him a proper burial. The gods were so touched by Cygnus's devotion to his brother that they turned him into a swan and placed him among the stars. In Ovid's Metamorphoses, there are three people named Cygnus, all of whom are transformed into swans. Alongside Cygnus, noted above, he mentions a boy from Tempe who commits suicide when Phyllius refuses to give him a tamed bull that he demands, but is transformed into a swan and flies away. He also mentions a son of Neptune who is an invulnerable warrior in the Trojan War who is eventually defeated by Achilles, but Neptune saves him by transforming him into a swan. Together with other avian constellations near the summer solstice, Vultur cadens and Aquila, Cygnus may be a significant part of the origin of the myth of the Stymphalian Birds, one of The Twelve Labours of Hercules. In Hinduism, the period of time or the Muhurta which lasts from 4:24 AM to 5:12 AM is called the "Brahma Muhurta" translating to "The moment of the Universe" and the Star system in correlation is the Cygnus constellation. This is a highly auspicious time to do any task or start the day. In Polynesia, Cygnus was often recognized as a separate constellation. In Tonga it was called Tuula-lupe, and in the Tuamotus it was called Fanui-tai. Deneb was also often given a name. The name Deneb comes from the Arabic name dhaneb, meaning "tail", from the phrase Dhanab ad-Dajājah, which means “the tail of the hen”. In New Zealand it was called Mara-tea, in the Society Islands it was called Pirae-tea or Taurua-i-te-haapa-raa-manu, and in the Tuamotus it was called Fanui-raro. Beta Cygni was named in New Zealand; it was likely called Whetu-kaupo. Gamma Cygni was called Fanui-runga in the Tuamotus. 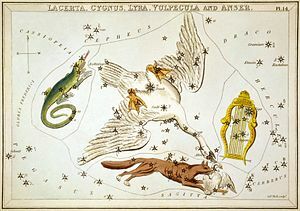 A very large constellation, Cygnus is bordered by Cepheus to the north and east, Draco to the north and west, Lyra to the west, Vulpecula to the south, Pegasus to the southeast and Lacerta to the east. The three-letter abbreviation for the constellation, as adopted by the IAU in 1922, is 'Cyg'. The official constellation boundaries, as set by Eugène Delporte in 1930, are defined as a polygon of 28 segments. In the equatorial coordinate system, the right ascension coordinates of these borders lie between 19h 07.3m and 22h 02.3m, while the declination coordinates are between 27.73° and 61.36°. Covering 804 square degrees and around 1.9% of the night sky, Cygnus ranks 16th of the 88 constellations in size. Cygnus culminates at midnight on 29 June, and is most visible in the evening from the early summer to mid-autumn in the Northern Hemisphere. Normally, Cygnus is depicted with Delta and Epsilon Cygni as its wings. Deneb, the brightest in the constellation is at its tail, and Albireo as the tip of its beak. There are several asterisms in Cygnus. In the 17th-century German celestial cartographer Johann Bayer's star atlas the Uranometria, Alpha, Beta and Gamma Cygni form the pole of a cross, while Delta and Epsilon form the cross beam. The nova P Cygni was then considered to be the body of Christ. The constellation Cygnus as it can be seen by the naked eye, with the Northern Cross in the middle. Bayer catalogued many stars in the constellation, giving them the Bayer designations from Alpha to Omega and then using lowercase Roman letters to g. John Flamsteed added the Roman letters h, i, k, l and m (these stars were considered informes by Bayer as they lay outside the asterism of Cygnus), but were dropped by Francis Baily. V1331 Cyg is located in the dark cloud LDN 981. There are several bright stars in Cygnus. Alpha Cygni, called Deneb, is the brightest star in Cygnus. It is a white supergiant star of spectral type A2Iae that varies between magnitudes 1.21 and 1.29, one of the largest and most luminous A-class stars known. It is located about 3200 light-years away. Its traditional name means "tail" and refers to its position in the constellation. Albireo, designated Beta Cygni, is a celebrated binary star among amateur astronomers for its contrasting hues. The primary is an orange-hued giant star of magnitude 3.1 and the secondary is a blue-green hued star of magnitude 5.1. The system is 380 light-years away and is divisible in large binoculars and all amateur telescopes. Gamma Cygni, traditionally named Sadr, is a yellow-tinged supergiant star of magnitude 2.2, 1500 light-years away. Its traditional name means "breast" and refers to its position in the constellation. Delta Cygni (the proper name is Fawaris) is another bright binary star in Cygnus, 171 light-years with a period of 800 years. The primary is a blue-white hued giant star of magnitude 2.9, and the secondary is a star of magnitude 6.6. The two components are divisible in a medium-sized amateur telescope. The fifth star in Cygnus above magnitude 3 is Aljanah, designated Epsilon Cygni. It is an orange-hued giant star of magnitude 2.5, 72 light-years from Earth. There are several other dimmer double and binary stars in Cygnus. Mu Cygni is a binary star with an optical tertiary component. The binary system has a period of 790 years and is 73 light-years from Earth. The primary and secondary, both white stars, are of magnitude 4.8 and 6.2, respectively. The unrelated tertiary component is of magnitude 6.9. Though the tertiary component is divisible in binoculars, the primary and secondary currently require a medium-sized amateur telescope to split, as they will through the year 2020. The two stars will be closest between 2043 and 2050, when they will require a telescope with larger aperture to split. 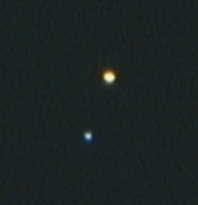 The stars 30 and 31 Cygni form a contrasting double star similar to the brighter Albireo. The two are divisible in binoculars. The primary, 31 Cygni, is an orange-hued star of magnitude 3.8, 1400 light-years from Earth. The secondary, 30 Cygni, appears blue-green. It is of spectral type A5IIIn and magnitude 4.83, and is around 610 light-years from Earth. 31 Cygni itself is a binary star; the tertiary component is a blue star of magnitude 7.0. Psi Cygni is a binary star divisible in small amateur telescopes, with two white components. The primary is of magnitude 5.0 and the secondary is of magnitude 7.5. 61 Cygni is a binary star divisible in large binoculars or a small amateur telescope. It is 11.4 light-years from Earth and has a period of 750 years. Both components are orange-hued dwarf (main sequence) stars; the primary is of magnitude 5.2 and the secondary is of magnitude 6.1. 61 Cygni is significant because Friedrich Wilhelm Bessel determined its parallax in 1838, the first star to have a known parallax. Located near Eta Cygni is the X-ray source Cygnus X-1, which is now thought to be caused by a black hole accreting matter in a binary star system. This was the first x-ray source widely believed to be a black hole. The two component stars of Albireo are easily distinguished, even in a small telescope. Cygnus also contains several other noteworthy X-ray sources. Cygnus X-3 is a microquasar containing a Wolf–Rayet star in orbit around a very compact object, with a period of only 4.8 hours. The system is one of the most intrinsically luminous X-ray sources observed. The system undergoes periodic outbursts of unknown nature, and during one such outburst, the system was found to be emitting muons, likely caused by neutrinos. While the compact object is thought to be a neutron star or possibly a black hole, it is possible that the object is instead a more exotic stellar remnant, possibly the first discovered quark star, hypothesized due to its production of cosmic rays that cannot be explained if the object is a normal neutron star. The system also emits cosmic rays and gamma rays, and has helped shed insight on to the formation of such rays. Cygnus X-2 is another X-ray binary, containing an A-type giant in orbit around a neutron star with a 9.8 day period. The system is interesting due to the rather small mass of the companion star, as most millisecond pulsars have much more massive companions. Another black hole in Cygnus is V404 Cygni, which consists of a K-type star orbiting around a black hole of around 12 solar masses. The black hole, similar to that of Cygnus X-3, has been hypothesized to be a quark star. 4U 2129+ 47 is another X-ray binary containing a neutron star which undergoes outbursts, as is EXO 2030+ 375. Cygnus is also home to several variable stars. SS Cygni is a dwarf nova which undergoes outbursts every 7–8 days. The system's total magnitude varies from 12th magnitude at its dimmest to 8th magnitude at its brightest. The two objects in the system are incredibly close together, with an orbital period of less than 0.28 days. Chi Cygni is a red giant and the second-brightest Mira variable star at its maximum. It ranges between magnitudes 3.3 and 14.2, and spectral types S6,2e to S10,4e (MSe) over a period of 408 days; it has a diameter of 300 solar diameters and is 350 light-years from Earth. P Cygni is a luminous blue variable that brightened suddenly to 3rd magnitude in 1600 AD. Since 1715, the star has been of 5th magnitude, despite being more than 5000 light-years from Earth. The star's spectrum is unusual in that it contains very strong emission lines resulting from surrounding nebulosity. W Cygni is a semi-regular variable red giant star, 618 light-years from Earth.It has a maximum magnitude of 5.10 and a minimum magnitude 6.83; its period of 131 days. It is a red giant ranging between spectral types M4e-M6e(Tc:)III, NML Cygni is a red hypergiant semi-regular variable star located at 5,300 light-years away from Earth. It is one of largest stars currently known in the galaxy with a radius exceeding 1,000 solar radii. Its magnitude is around 16.6, its period is about 940 days. Cygnus contains the binary star system KIC 9832227. It is predicted that the two stars will coalesce in about 2022, briefly forming a new naked-eye object. The North America Nebula (NGC 7000) is one of the most well-known nebulae in Cygnus. There is an abundance of deep-sky objects, with many open clusters, nebulae of various types and supernova remnants found in Cygnus due to its position on the Milky Way. Some open clusters can be difficult to make out from a rich background of stars. M39 (NGC 7092) is an open cluster 950 light-years from Earth that is visible to the unaided eye under dark skies. It is loose, with about 30 stars arranged over a wide area; their conformation appears triangular. The brightest stars of M39 are of the 7th magnitude. Another open cluster in Cygnus is NGC 6910, also called the Rocking Horse Cluster, possessing 16 stars with a diameter of 5 arcminutes visible in a small amateur instrument; it is of magnitude 7.4. The brightest of these are two gold-hued stars, which represent the bottom of the toy it is named for. A larger amateur instrument reveals 8 more stars, nebulosity to the east and west of the cluster, and a diameter of 9 arcminutes. The nebulosity in this region is part of the Gamma Cygni Nebula. The other stars, approximately 3700 light-years from Earth, are mostly blue-white and very hot. Other open clusters in Cygnus include Dolidze 9, Collinder 421, Dolidze 11, and Berkeley 90. Dolidze 9, 2800 light-years from Earth and relatively young at 20 million light-years old, is a faint open cluster with up to 22 stars visible in small and medium-sized amateur telescopes. Nebulosity is visible to the north and east of the cluster, which is 7 arcminutes in diameter. The brightest star appears in the eastern part of the cluster and is of the 7th magnitude; another bright star has a yellow hue. Dolidze 11 is an open cluster 400 million years old, farthest away of the three at 3700 light-years. More than 10 stars are visible in an amateur instrument in this cluster, of similar size to Dolidze 9 at 7 arcminutes in diameter, whose brightest star is of magnitude 7.5. It, too, has nebulosity in the east. Collinder 421 is a particularly old open cluster at an age of approximately 1 billion years; it is of magnitude 10.1. 3100 light-years from Earth, more than 30 stars are visible in a diameter of 8 arcseconds. The prominent star in the north of the cluster has a golden color, whereas the stars in the south of the cluster appear orange. Collinder 421 appears to be embedded in nebulosity, which extends past the cluster's borders to its west. Berkeley 90 is a smaller open cluster, with a diameter of 5 arcminutes. More than 16 members appear in an amateur telescope. NGC 6826, the Blinking Planetary Nebula, is a planetary nebula with a magnitude of 8.5, 3200 light-years from Earth. It appears to "blink" in the eyepiece of a telescope because its central star is unusually bright (10th magnitude). When an observer focuses on the star, the nebula appears to fade away. Less than one degree from the Blinking Planetary is the double star 16 Cygni. The North America Nebula (NGC 7000) is one of the most well-known nebulae in Cygnus, because it is visible to the unaided eye under dark skies, as a bright patch in the Milky Way. However, its characteristic shape is only visible in long-exposure photographs – it is difficult to observe in telescopes because of its low surface brightness. It has low surface brightness because it is so large; at its widest, the North America Nebula is 2 degrees across. Illuminated by a hot embedded star of magnitude 6, NGC 7000 is 1500 light-years from Earth. NGC 6992 (Eastern Veil Nebula - center) and NGC 6960 (Western Veil Nebula - upper right) photographed from a dark site. To the south of Epsilon Cygni is the Veil Nebula (NGC 6960, 6962, 6979, 6992, and 6995), a 5,000-year-old supernova remnant covering approximately 3 degrees of the sky - it is over 50 light-years long. 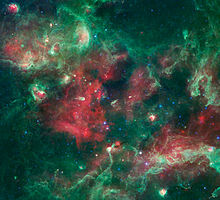 Because of its appearance, it is also called the Cygnus Loop. The Loop is only visible in long-exposure astrophotographs. However, the brightest portion, NGC 6992, is faintly visible in binoculars, and a dimmer portion, NGC 6960, is visible in wide-angle telescopes. The Northern Coalsack Nebula, also called the Cygnus Rift, is a dark nebula located in the Cygnus Milky Way. Cygnus X, a large region of star-formation in Cygnus. The Gamma Cygni Nebula (IC 1318) includes both bright and dark nebulae in an area of over 4 degrees. DWB 87 is another of the many bright emission nebulae in Cygnus, 7.8 by 4.3 arcminutes. It is in the Gamma Cygni area. Two other emission nebulae include Sharpless 2-112 and Sharpless 2-115. When viewed in an amateur telescope, Sharpless 2–112 appears to be in a teardrop shape. More of the nebula's eastern portion is visible with an O III (doubly ionized oxygen) filter. There is an orange star of magnitude 10 nearby and a star of magnitude 9 near the nebula's northwest edge. Further to the northwest, there is a dark rift and another bright patch. The whole nebula measures 15 arcminutes in diameter. Sharpless 2–115 is another emission nebula with a complex pattern of light and dark patches. Two pairs of stars appear in the nebula; it is larger near the southwestern pair. The open cluster Berkeley 90 is embedded in this large nebula, which measures 30 by 20 arcminutes. Also of note is the Crescent Nebula (NGC 6888), located between Gamma and Eta Cygni, which was formed by the Wolf–Rayet star HD 192163. In recent years, amateur astronomers have made some notable Cygnus discoveries. The "Soap bubble nebula" (PN G75.5+1.7), near the Crescent nebula, was discovered on a digital image by Dave Jurasevich in 2007. In 2011, Austrian amateur Matthias Kronberger discovered a planetary nebula (Kronberger 61, now nicknamed "The Soccer Ball") on old survey photos, confirmed recently in images by the Gemini Observatory; both of these are likely too faint to be detected by eye in a small amateur scope. 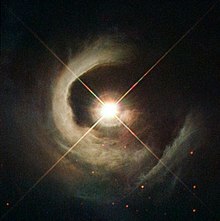 But a much more obscure and relatively 'tiny' object—one which is readily seen in dark skies by amateur telescopes, under good conditions—is the newly discovered nebula (likely reflection type) associated with the star 4 Cygni (HD 183056): an approximately fan-shaped glowing region of several arcminutes' diameter, to the south and west of the fifth-magnitude star. It was first discovered visually near San Jose, California and publicly reported by amateur astronomer Stephen Waldee in 2007, and was confirmed photographically by Al Howard in 2010. California amateur astronomer Dana Patchick also says he detected it on the Palomar Observatory survey photos in 2005 but had not published it for others to confirm and analyze at the time of Waldee's first official notices and later 2010 paper. Cygnus X is the largest star-forming region in the Solar neighborhood and includes not only some of the brightest and most massive stars known (such as Cygnus OB2-12), but also Cygnus OB2, a massive stellar association classified by some authors as a young globular cluster. More supernovae have been seen in the Fireworks Galaxy (NGC 6946) than in any other galaxy. Cygnus A is the first radio galaxy discovered; at a distance of 730 million light-years from Earth, it is the closest powerful radio galaxy. In the visible spectrum, it appears as an elliptical galaxy in a small cluster. It is classified as an active galaxy because the supermassive black hole at its nucleus is accreting matter, which produces two jets of matter from the poles. The jets' interaction with the interstellar medium creates radio lobes, one source of radio emissions. Cygnus is also the apparent source of the WIMP-wind due to the orientation of the solar system's rotation through the galactic halo. ^ a b Stuart Clark (29 July 2018). "Starwatch: the bright stars of the Summer Triangle". The Guardian. ^ "Deneb - Alpha Cygni". Constellation Guide. ^ Chandra X-ray Observatory (8 November 2012). "Star Cluster Cygnus OB2". SciTechDaily. ^ a b c d e f g h i Ridpath & Tirion 2001, pp. 134–137. ^ P.K. Chen (2007) A Constellation Album: Stars and Mythology of the Night Sky, p. 70 (ISBN 978-1-931559-38-6). ^ Allen (1963) p. 56. ^ "Cygnus Constellation: Facts, Myth, Star Map, Major Stars, Deep Sky Objects - Constellation Guide". constellation-guide.com. ^ Makemson 1941, p. 282. ^ "Cygnus, Constellation Boundary". The Constellations. Retrieved 9 December 2013. ^ a b c Thompson, Robert; Thompson, Barbara (2007). Illustrated Guide to Astronomical Wonders: From Novice to Master Observer. Sebastopol, California: O'Reilly Media. pp. 214–15. ISBN 978-0-596-52685-6. ^ Dr. Jason Lisle (2012). The Stargazer's Guide to the Night Sky. New Leaf Publishing Group. p. 65. ^ a b Wagman, Morton (2003). Lost Stars: Lost, Missing and Troublesome Stars from the Catalogues of Johannes Bayer, Nicholas Louis de Lacaille, John Flamsteed, and Sundry Others. Blacksburg, Virginia: The McDonald & Woodward Publishing Company. p. 131. ISBN 978-0-939923-78-6. ^ "A young star takes centre stage". ESA/Hubble Picture of the Week. ESA/Hubble. Retrieved 3 March 2015. ^ BSJ (4 January 2010). "Alpha Cygni". AAVSO Website. American Association of Variable Star Observers. Retrieved 22 December 2013. ^ Jim Kaler (26 June 2009). "Deneb". Stars. Retrieved 15 January 2013. ^ "Deneb: A distant and very luminous star". Retrieved 15 January 2013. ^ Jim Kaler. "Albireo". Stars. Retrieved 15 January 2013. ^ Jim Kaler (30 November 2012). "Sadr". Stars. Retrieved 15 January 2013. ^ Jim Kaler. "DELTA CYG". Stars. Retrieved 15 January 2013. ^ Jim Kaler. "Gienah Cygni". Stars. Retrieved 15 January 2013. ^ Ridpath & Tirion 2001, pp. 134–37. ^ "30 Cygni – Variable Star". SIMBAD Astronomical Database. Centre de Données astronomiques de Strasbourg. Archived from the original on 14 December 2012. Retrieved 31 December 2013. ^ Kim, J. S.; Kim, S. W.; Kurayama, T.; Honma, M.; Sasao, T.; Kim, S. J. (2013). "Vlbi Observation of Microquasar Cyg X-3 During an X-Ray State Transition from Soft to Hard in the 2007 May-June Flare". The Astrophysical Journal. 772 (1): 41. arXiv:1307.1226. Bibcode:2013ApJ...772...41K. doi:10.1088/0004-637X/772/1/41. ^ Becker, R. H.; Robinson-Saba, J. L.; Pravdo, S. H.; Boldt, E. A.; Holt, S. S.; Serlemitsos, P. J.; Swank, J. H. (1978). "A 4.8 hour periodicity in the spectra of Cygnus X-3". The Astrophysical Journal. 224: L113. Bibcode:1978ApJ...224L.113B. doi:10.1086/182772. ^ Körding, E.; Colbert, E.; Falcke, H. (2005). "A radio monitoring survey of ultra-luminous X-ray sources". Astronomy and Astrophysics. 436 (2): 427. arXiv:astro-ph/0502265. Bibcode:2005A&A...436..427K. doi:10.1051/0004-6361:20042452. ^ Fender, R. P.; Hanson, M. M.; Pooley, G. G. (1999). "Infrared spectroscopic variability of Cygnus X-3 in outburst and quiescence". Monthly Notices of the Royal Astronomical Society. 308 (2): 473. arXiv:astro-ph/9903435. Bibcode:1999MNRAS.308..473F. doi:10.1046/j.1365-8711.1999.02726.x. ^ Marshak, M.; Bartelt, J.; Courant, H.; Heller, K.; Joyce, T.; Peterson, E.; Ruddick, K.; Shupe, M.; Ayres, D.; Dawson, J.; Fields, T.; May, E.; Price, L.; Sivaprasad, K. (1985). "Evidence for Muon Production by Particles from Cygnus X-3" (Submitted manuscript). Physical Review Letters. 54 (19): 2079–2082. Bibcode:1985PhRvL..54.2079M. doi:10.1103/PhysRevLett.54.2079. PMID 10031224. ^ Zdziarski, A. A.; Mikolajewska, J.; Belczynski, K. (2012). "Cyg X-3: A low-mass black hole or a neutron star". Monthly Notices of the Royal Astronomical Society: Letters. 429: L104–L108. arXiv:1208.5455. Bibcode:2013MNRAS.429L.104Z. doi:10.1093/mnrasl/sls035. ^ Baym, G.; Kolb, E. W.; McLerran, L.; Walker, T. P.; Jaffe, R. L. (1985). "Is Cygnus X-3 strange?". Physics Letters B. 160 (1–3): 181. Bibcode:1985PhLB..160..181B. doi:10.1016/0370-2693(85)91489-3. ^ MacKeown, P. K.; Weekes, T. C. (1985). "Cosmic Rays from Cygnus X-3". Scientific American. 253 (5): 60. Bibcode:1985SciAm.253e..60M. doi:10.1038/scientificamerican1185-60. ^ Crampton, D.; Cowley, A. P. (1980). "Confirmation of a 9.8-day period of Cygnus X-2". Publications of the Astronomical Society of the Pacific. 92: 147. Bibcode:1980PASP...92..147C. doi:10.1086/130636. ^ King, A. R.; Ritter, H. (1999). "Cygnus X-2, super-Eddington mass transfer, and pulsar binaries". Monthly Notices of the Royal Astronomical Society. 309 (1): 253. arXiv:astro-ph/9812343. Bibcode:1999MNRAS.309..253K. doi:10.1046/j.1365-8711.1999.02862.x. ^ Shahbaz, T.; Ringwald, F. A.; Bunn, J. C.; Naylor, T.; Charles, P. A.; Casares, J. (1994). "The mass of the black hole in V404 Cygni". MNRAS. 271: L1–L14. Bibcode:1994MNRAS.271L..10S. doi:10.1093/mnras/271.1.10L (inactive 13 September 2018). ^ Kovács, Z.; Cheng, K. S.; Harko, T. (2009). "Can stellar mass black holes be quark stars?". Monthly Notices of the Royal Astronomical Society. 400 (3): 1632–1642. arXiv:0908.2672. Bibcode:2009MNRAS.400.1632K. doi:10.1111/j.1365-2966.2009.15571.x. ^ Nowak, M. A.; Heinz, S.; Begelman, M. C. (2002). "Hiding in Plain Sight:ChandraObservations of the Quiescent Neutron Star 4U 2129+47 in Eclipse". The Astrophysical Journal. 573 (2): 778. arXiv:astro-ph/0204503. Bibcode:2002ApJ...573..778N. doi:10.1086/340757. ^ Wilson, C. A.; Finger, M. H.; Camero‐Arranz, A. N. (2008). "Outbursts Large and Small from EXO 2030+375". The Astrophysical Journal. 678 (2): 1263. arXiv:0804.1375. Bibcode:2008ApJ...678.1263W. doi:10.1086/587134. ^ Honey, W.B. ; et al. (1989). "Quiescent and Outburst Photometry of the Dwarf Nova SS Cygni" (PDF). Monthly Notices of the Royal Astronomical Society. 236 (4): 727–34. Bibcode:1989MNRAS.236..727H. doi:10.1093/mnras/236.4.727. ^ BSJ (4 January 2010). "khi Cygni". AAVSO Website. American Association of Variable Star Observers. Retrieved 22 December 2013. ^ Burnham, Jr., Robert (1978). Burnham's Celestial Handbook: An Observer's Guide to the Universe Beyond the Solar System. Volume Two (Revised and Enlarged ed.). New York: Dover Publications. pp. 772–773. ^ Markova, N.; Groot, M. (1997). "An analysis of emission lines in the spectrum of P Cygni". Astronomy and Astrophysics. 326: 1111–16. Bibcode:1997A&A...326.1111M. ^ BSJ (19 August 2011). "W Cygni". AAVSO Website. American Association of Variable Star Observers. Retrieved 31 December 2013. ^ De Beck, E.; Decin, L.; de Koter, A.; Justtanont, K.; Verhoelst, T.; Kemper, F.; Menten, K. M. (November 2010). "Probing the mass-loss history of AGB and red supergiant stars from CO rotational line profiles". Astronomy & Astrophysics. 523: A18. arXiv:1008.1083. doi:10.1051/0004-6361/200913771. ISSN 0004-6361. ^ Schuster, M. T.; Marengo, M.; Hora, J. L.; Fazio, G. G.; Humphreys, R. M.; Gehrz, R. D.; Hinz, P. M.; Kenworthy, M. A.; Hoffmann, W. F. (2009). "Imaging the Cool Hypergiant NML Cygni's Dusty Circumstellar Envelope with Adaptive Optics". The Astrophysical Journal. 699 (2): 1423–1432. arXiv:0904.4690. Bibcode:2009ApJ...699.1423S. doi:10.1088/0004-637X/699/2/1423. ^ "Binary star bash-up should add new light to Northern Cross in 2022". ^ "Kepler: NASA's First Mission Capable of Finding Earth-Size Planets" (PDF). NASA. February 2009. Retrieved 14 March 2009. ^ Lissauer, J. J.; et al. (3 February 2011). "A closely packed system of low-mass, low-density planets transiting Kepler-11" (PDF). Nature. 470 (7332): 53–58. arXiv:1102.0291. Bibcode:2011Natur.470...53L. doi:10.1038/nature09760. PMID 21293371. Retrieved 4 February 2011. ^ Raghavan; Henry, Todd J.; Mason, Brian D.; Subasavage, John P.; Jao, Wei‐Chun; Beaulieu, Thom D.; Hambly, Nigel C. (2006). "Two Suns in The Sky: Stellar Multiplicity in Exoplanet Systems". The Astrophysical Journal. 646 (1): 523–542. arXiv:astro-ph/0603836. Bibcode:2006ApJ...646..523R. doi:10.1086/504823. ^ E. Plávalová; N. A. Solovaya (2013). "Analysis of the motion of an extrasolar planet in a binary system". Astronomy & Astrophysics. 146 (5): 108. arXiv:1212.3843. Bibcode:2013AJ....146..108P. doi:10.1088/0004-6256/146/5/108. ^ Naef, D.; et al. (2003). "The ELODIE survey for northern extra-solar planets II. A Jovian planet on a long-period orbit around GJ 777 A". Astronomy and Astrophysics. 410 (3): 1051–1054. arXiv:astro-ph/0306586. Bibcode:2003A&A...410.1051N. doi:10.1051/0004-6361:20031341. ^ Vogt, Steven S.; et al. (2005). "Five New Multicomponent Planetary Systems". The Astrophysical Journal. 632 (1): 638–658. Bibcode:2005ApJ...632..638V. doi:10.1086/432901. ^ "Kepler 22-b: Earth-like planet confirmed". BBC. 5 December 2011. Retrieved 6 December 2011. ^ a b c French, Sue (September 2012). "Guide Me, Cygnus". Sky and Telescope: 58–60. ^ a b Levy 2005, pp. 130–131. ^ a b c Wilkins, Jamie; Dunn, Robert (2006). 300 Astronomical Objects: A Visual Reference to the Universe. Buffalo, New York: Firefly Books. ISBN 978-1-55407-175-3. ^ Nemiroff, R.; Bonnell, J., eds. (1 November 2004). "Spooky Star Forming Region DR 6". Astronomy Picture of the Day. NASA. Retrieved 23 October 2008. ^ "Directional detection of Dark Matter with MIMAC: WIMP identification and track reconstruction". ResearchGate. Allen, R. H. (1963). Star Names: Their Lore and Meaning (Reprint ed.). New York, NY: Dover Publications Inc. ISBN 978-0-486-21079-7. Wikisource has the text of the 1911 Encyclopædia Britannica article Cygnus.